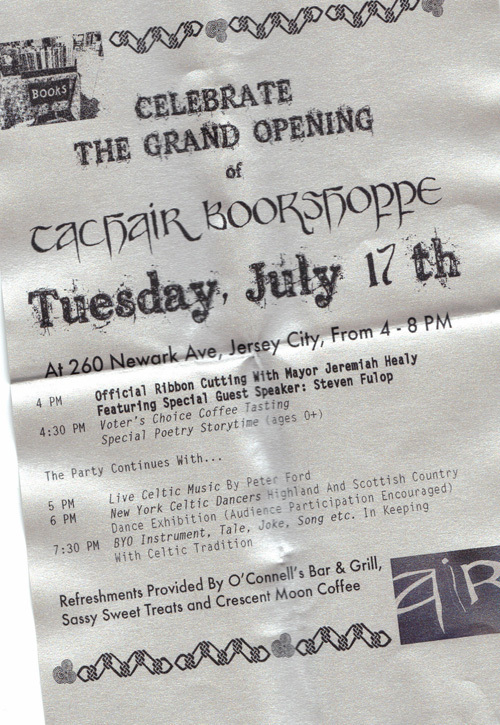 The 7/17 grand opening celebration of Tachair Bookshoppe is less than a week away. Carol and Aleta Valleau – the mother/daughter team behind this new enterprise – are not frantic, but they are busy as they finish making their Newark Avenue space customer ready. Cellphone calls are constant interruptions. Fixtures still need to be assembled. Representatives from the building stop by, neighboring merchants come to check on the progress. Curious pedestrians look through the doorway. Above the storefront now hangs the hand-painted sign, although the spotlights that shine on the sign still aren’t yet working. Inside, the coffee/tea bar still needs to be completed. Various pieces of beverage dispensing equipment remain in boxes. 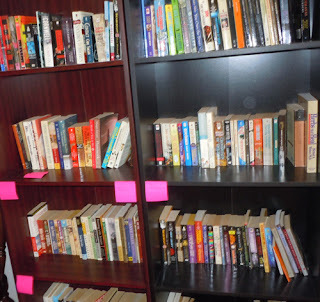 The new children’s books need to be unpacked, inventoried, and shelved, and the stocked bookshelves have post-it notes delineating subject category. More shelves are on the way, soon to be followed by books to fill them. But it seems a certainty what needs to be done for the official opening will be done. 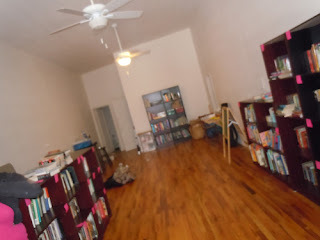 Already the space looks like what it soon will be – a bookstore. 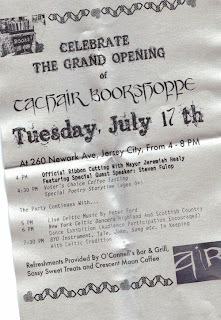 Yes, what had long been an accepted impossibility will now be made reality – in a few days, Jersey City will have a bookstore. 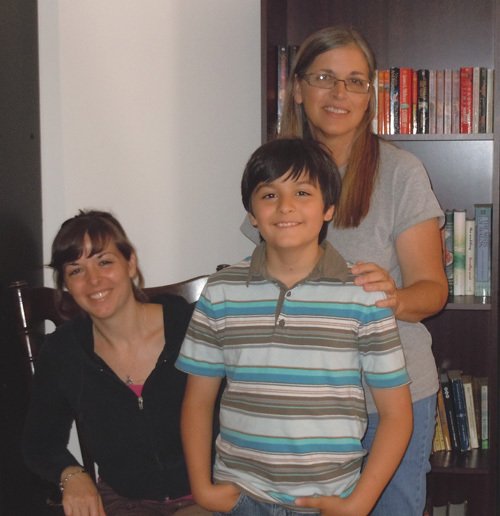 This family’s book love is multigenerational. Paul – Aleta’s 10 year old son – founded Opus Jr., a fund-raising program that collects then re-sells used children’s books to benefit the Jersey City Free Public Library (facebook page). 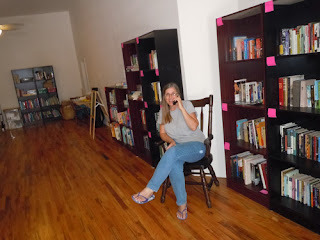 Paul passed the $4,000 mark (yes, $4,000 donated to the Jersey City Public Library) on July10th. Both Opus Jr. and the outreach stands at the Jersey City markets will continue after the opening of the brick and mortar location. Readers of this blog are of course are familiar with Dislocation Documentation of the closing of B. Daltons at the Newport Mall, Barnes& Noble stores in Hoboken and an NYC Borders. In the 90s, Book superstores like Barnes and Noble began to edge out the independents. The advent of Amazon turned the fire into an inferno; the destruction was relentless and endless. E-readers seemed to sweep away emebers still glowing. Consumers asked themselves: why go to a bookstore at all? If consumers follow the money, the page has turned on the era of turning paper pages and in fact the days of bookstores are as numbered as those very pages. Yikes – how’s that for an extended metaphor that may be more pun than analogy. Compared to the number bookselling jobs lost with these widespread store closures, how much employment did the Nook or Kindle create? What else have we lost with the massive elimination of bookstores? Browsing titles and the space around which a community can coalesce; these are quality of life experiences only bookstores provide. Online book buying, the e-readers – these have positives, but do we really want to completely lose what their proliferation is destroying? Books are profitable, but they aren’t as profitable as e-readers and online book retailing. Must every aspect of life – and community – be determined by how much profit can be maximized? Oren Teicher, CEO of the ABA, at the 2012 BookExpo America ( June 5), said: "it’s also heartening to report that the indie book sales as tracked by Nielsen BookScan have continued to show the double-digit increases over the previous year that we saw throughout the 2011 holiday season. For the first 20 weeks of 2012, we have seen a 13.4 percent increase in unit sales. I recognize those increases have not happened everywhere but, on balance, the indisputable fact is that today we as a channel are selling more books than we were a year ago." 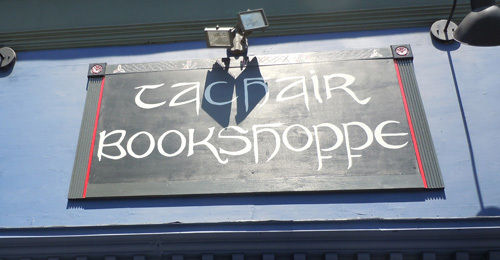 Tachair Bookshoppe is reimagining not just the book store with its mix of used and new inventory and the café component, but also what Newark Avenue can be. 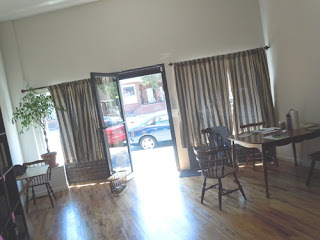 The most recent tenant of the space was a convenience store, an inner-city mash up of 7-11 and Dollar Tree. The cashiers were friendly and entertaining, but what a grimy store. With freshly painted walls, spinning fans suspended from the ceiling and a gleaming wood floor, the space has been fully transformed. The high ceiling and wide walls remind one of a Soho art gallery (in fact, art exhibitions to be staged in Tachair are in the planning stages.) Even with the space incomplete, a quaint and bookish feeling is present – warm, cozy, inviting. A large table is in the front portion of the store, wooden chairs are also throughout. 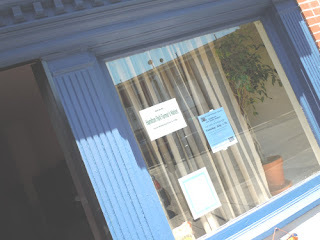 Browsing, lingering, conversation are encouraged, but not laptop use (no free wifi). 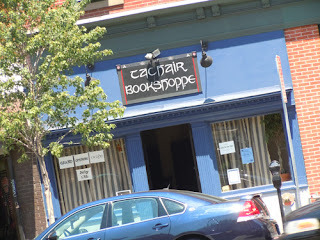 The coffee/tea bar – which will also include snack items –means Tachair Bookshoppe doubles as a neighborhood café. It seems a comfortable place to spend some time in; a destination worth visiting. 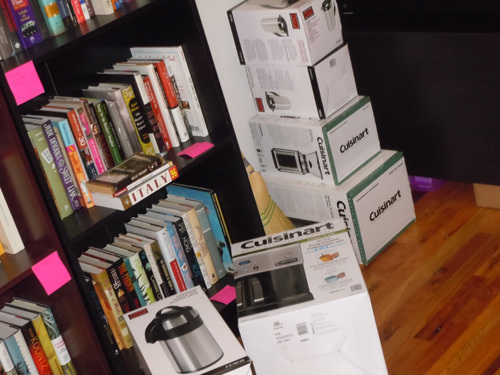 The inventory will include both new and used books. There’s more than twice the amount of used books on display in storage, said Carol. Accumulating new inventory is also ongoing. All the used books have been digitally cataloged. If you don’t see a book on the shelf and it’s in the inventory, Tachair Bookshoppe can have it for you the next day. If a customer wants a new book that isn’t in stock, Tachair can order it from their wholesaler (no shipping charges for the customer). Not everything is figured out, but that seems part of the Tachair Bookshoppe appeal: an ongoing work in progress.